Delphi students thrive in a dynamic learning environment, becoming competent, confident learners who maintain a true joy for learning. Active. Engaging. Personal. Creative. Relevant. The Delphi Program is rich and comprehensive course of study that has been extensively researched, developed, piloted and used for over 40 years by a national network of acclaimed schools. With a proven curriculum and highly effective approach to learning, young children build a firm foundation of knowledge, study skills and life skills. Graduates head off to high school with the personal and academic tools they need to succeed. Talk to a student graduating from Delphi Academy and you’ll hear common refrains: the personalized nature of the program, the encouragement and guidance they received from every teacher, and the confidence they feel having mastered both study and organizational skills that will help them learn anything they seek to know in the future. Students who love to learn. Students who are becoming independent learners and thinkers. Independent learners, thinkers and leaders. Our philosophy of education is simple. Students should be given a firm foundation in both academics and life skills to give them the tools and knowledge they need to problem-solve, persist and succeed in their future goals. Our teaching and study methods emphasize practical application––because only in meaningful use can one work out the relationships and value of the many pieces of knowledge encountered in an education. In the end, we want to see our students maintain their individuality while being self-motivated, confident, active and purposeful individuals who are capable of pursuing and reaching their chosen goals. When a learner arrives, they are quickly oriented to the dynamic classroom environment. Our student-centered approach is new to most students but they soon realize that they are in the driver's seat of their own education. We give them a personalized program so they aren't repeating what they already know and are studying at the exact right level for them. As they continue through the Delphi Program, students become familiar with many different approaches to learning and are encouraged to find answers for themselves. For example, we expect them to conduct a science experiment, not just watch a teacher do it and take notes. We bring experts into the classroom and take students on field trips to interact with professionals and to ask questions. Delphi students learn by doing: visiting, talking to experts, asking questions, experimenting, drawing, testing and designing – not just by reading textbooks. Students work on social skills and soft skills, too: getting along with others, collaborating, sharing, communicating well, and managing relationships with others. Additionally, we orient new learners to the Delphi culture of doing one's best, treating others well, learning to set goals and striving to achieve those goals with self-determination. Self-determination is a combination of attitudes and abilities that lead people to set goals for themselves and take the initiative to reach these goals. Most learners quickly adapt to the freedom and demands of Delphi's active and personalized curriculum. The classroom environment and encouragement from teachers and peers creates school culture where students learn willingly and with great interest. Targets that may have seemed stressful in another setting can become a game and a challenge. It is our goal that learners find their education enjoyable! At Delphi, the student, teacher and parents form a team. In the beginning levels, the child is young and just getting accustomed to attending school. Naturally, the teacher is the main guide while the parents support the child's education with love, good nutrition, a stable schedule, regular communication with the teacher, etc. As the child grows up, however, it is the learner who can take the reins, set the goals, and gradually become the manager. By Middle School, the teacher becomes more of a supervisor and mentor as the student becomes a more independent, responsible, self-motivated and confident learner. The Delphi Program is quite unique. One way we set ourselves apart is the division of education levels into "Forms". So, what is a Form, exactly? 1. A class or grouping of students, especially in the United Kingdom or private school. 2. A rich, engaging curriculum of study and practical application, field trips and activities designed to empower students at Delphi Academy to love and "own" their education. In a traditional school, students attend class for nine months and pass on to the next grade level at the end of the year. Parents hope that their child learned everything necessary to do well the following year, but unfortunately, many students find they have gaps of learning in their education. As a result, particular subjects become "hard" and students find themselves simply memorizing for a test or completely falling behind. The Delphi Program avoids these pitfalls by making learning the constant and time the variable. In other words, we ask each learner to demonstrate mastery of a topic before they move on to the next one -- thus avoiding any educational holes that will cause a student to stumble on higher materials. As a result, quick learners can fly ahead but when they hit a subject of greater challenge they can slow down and take the time to truly understand and master the topic. A Delphi classroom maintains an energetic balance of order and independence. During a reading period, for example, each student will be reading a book at the level that is right for them. One learner may be far ahead in the reading portion of the Form while another is still in the early books. Delphi teachers are trained to supervise all the learners and keep each one progressing smoothly. While it may sound complicated, a visit to a classroom in action shows how smooth and workable this model can be and how learners thrive when studying a curriculum that lets them master each step at a gradient that is neither too easy nor too difficult. Parents often comment on the changes and gains in maturity they see as their child progresses through a Form. Students are working on such a variety of things - new P.E. skills, home projects such as cooking and nutrition, community service, gardening, wood shop, coding, etc. - and setting their own targets and goals to accomplish steps on their Form. It is a natural way to learn and students enjoy taking on new challenges, gaining new abilities and becoming the managers of their own education. The world is changing so fast that by the time our students graduate college, there will likely be many entirely new branches of technology and career opportunities available that do not exist today. So, how do we prepare children to succeed in a future we cannot predict? Our answer is to give students a solid foundation of S.T.E.M. and liberal arts studies, plus empower them with top notch study skills and the ability to study any new subject with confidence. All through the Delphi Program, starting in Kindergarten, learners are encouraged to ask questions. We teach them to look and observe for themselves, give them level-appropriate opportunities for critical thinking and hands-on projects, and empower them to learn anything they want to learn. Somewhere along the line every learner faces a challenge or confusion in a particular topic. Having great study skills helps. A teacher that is available to each individual and easy to talk to is also very helpful. Delphi teachers seek to nurture each learner's resilience and persistence, fostering a willingness to work hard, rise to challenges and realize, "OK, I know I can get this; I just haven't gotten it yet." The Delphi Standards Department has the responsibility of seeing that the students have achieved the requirements of each Form. The educators here support the teaching staff in two ways. If a student is struggling in a subject and needs more help than the teacher can address in the classroom setting, the teacher can send the student to Standards for extra one-on-one help. Additionally, all exams are administered in Standards, including the final Form Exam required for graduation from a Form. Anyone who studies something usually hopes to learn it 100% so they can effectively use the information or skills in life. Learning a technology of study can help students achieve those goals. The Delphi Program uses "Study Technology" to help students become confident and enthusiastic independent learners. 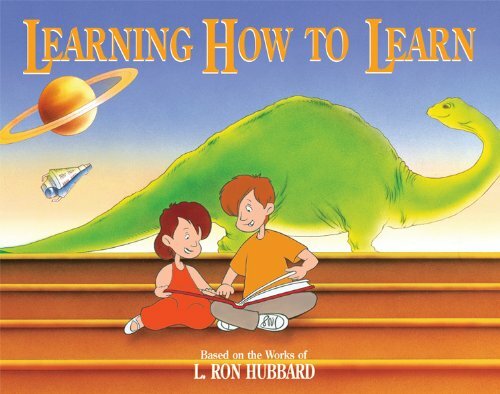 The basic principles of Study Technology are covered in the children's book by American writer and educator L. Ron Hubbard titled Learning How to Learn, which begins with the line, “You can learn anything you want to learn.” This book is covered in every tour to new families and a copy is provided to parents upon enrollment of their child. Delphi students first study this book in Level 3 at the end of Lower Elementary School. Study Technology is both a learning and a teaching method that helps students and teachers alike identify barriers to understanding and tackle difficulties in study. It is not a set of study tips or memory tricks, but is an understanding of the learning process itself. This simple yet precise set of tools helps a student spot study challenges and effectively turn those difficulties around. The basic concepts of Study Technology have been incorporated throughout the Delphi curriculum, in the aim for mastery, the arrangement of the classroom, the role of the teacher, the personal attention given to learners and the positive attitude towards learning. How did Study Technology Begin? “Study Technology is a secular (non-religious) method of study developed by L. Ron Hubbard, an American writer and philosopher who became interested in education as a young man while teaching English in a native school in Guam during the 1920’s. In the 1960’s, he saw that declining educational standards were having a profound effect on the learning abilities of people from all walks of life. His investigation of this decline and subsequent research into the learning process led to the development of a unique and effective approach to learning – Study Technology. As such, the school owes a debt of gratitude to Mr. Hubbard. His secular writings on education, ethics and organization inspired the school’s mission and educational philosophy. Delphi gave us a lot of practical experiences that I don’t think other kids have had in school. Things like class projects, community service and leadership end up coming easier to me because I have all this experience to draw on. Both of my children graduated from Delphi and adjusted easily to their local, public high schools. They had developed a strong work ethic and the study skills to dig in and understand the materials on their own that has really served them well. I find that, somehow, those of us who graduated from Delphi are quick to understand verbal instructions and lectures. Kids in my class will ask me for help when they can’t catch what to do or what was meant.